Part I What is a Person? Part II What is Learning? Everything in this book is based on my own self-aware contemplation of the world, and on my evolving design of a world view. It could not be otherwise. By nature, as a human, I am a thinking being, as we have seen earlier. Nobody can tell me how to think, or what to think. I have to figure that out by myself, and I can, thanks to my self-awareness. And thanks to my ability to communicate, I can try to reveal to the best of my ability how I think and what I am thinking, so that I can share my thoughts with others; and in order for me to benefit from their thinking, I have to try to understand how they think and what they are thinking. When one thinks about this, one realizes that, absent some common standard that applies to all our thinking, it is difficult if not impossible for us to benefit from sharing our thoughts. The quest for some common ground in the mode of thinking all humans engage in would seem to make sense, if we are to collaborate in anything meaningful. All well and good, but there is not likely to be any common ground spontaneously. The odds are against it. Which means that it is hardly surprising that people have always sought to prescribe a common ground, and gain widespread agreement as to what it is. The attempt to lay down rules for proper thinking is little more than an attempt to make collaboration in thought possible. Historically, only one such attempt has gained wide currency: that of the ancient Greek thinkers, who launched a process of defining a particular method of thinking as the only acceptable one. This method was labeled “rational” or “logical” thinking, and those who used it were considered to be “reasonable” people. Anyone who rejected this method was said to be “unreasonable”, a label that the proponents of rational thought managed to give a highly derogatory meaning. Calling someone unreasonable or irrational, or saying that a statement was illogical, came to be the ultimate rejection of the legitimacy of that person’s way of thought. What is this method of thinking? Why has it been so appealing to so many people for over two millennia? To what extent does it in fact serve as a common, widely accepted proper mode of thought to the exclusion of all others? History provides an answer to these questions, in the form of surviving writings—some fragmentary—of ancient Greek philosophers. A group that flourished in the 5th century BCE in the town of Elea, known as the Eleatic School of thought, first came up with the notion that proper thinking should not allow a person to consider both a statement and its converse to be simultaneously valid. (This has come to be labeled “the law of contradiction”.) We have no way of knowing where this notion came from, or why the Eleatics gave it such prominence. At first blush, it seems to be a trivial, highly unnotable statement. Thus, it would seem to be absurd to say that the print on this page is black, and that, at the same time, the print on this page is not black. Why even discuss the question of whether saying these two things makes sense? After all, the statement about the color of the print is more or less a way of defining what the person speaking means by the word “black”—or at least, giving another example from the speaker’s experience that joins other of his experiences to collectively define the adjective “black”. If the person didn’t think that experience should be joined to the others in the pool of “black-defining experiences”, he wouldn’t say it should. Saying the print is black is a declaration related to the definition of the adjective. We shall see where this line of thought was less of a truism than it appeared to be to the Eleatics.8 But for the moment, let’s pick up the trail of Greek thinking from the invention of the law of contradiction forward in time. Over the next couple of centuries, various Greek philosophers became intrigued by the effort to define proper thinking, and used as their starting point the law of contradiction. Perhaps the best known philosopher to pick up the thread—best known thanks to the survival of much literature about him—was Socrates, many of whose ruminations were preserved by his pupil Plato. Much of Socrates’ thought was devoted to applying the law of contradiction to a host of everyday situations, and exploring the difficulties that arose from the effort to do so. Meanwhile, his pupil went on to create new ways of looking at language and, as a consequence, at the world of experience. The culmination of all this was the work of Plato’s pupil Aristotle, perhaps the greatest thinker in recorded history. Aristotle, using the law of contradiction as his model, invented an entire framework for human thought, one which he took to define the limits of appropriate thought. The basis of this framework was his work on logic (from the Greek word logo, meaning “word”); the name he gave to the proper way of thinking based on logic was “reason” or “rational thought”. Using that as his framework, he defined a whole series of fields of inquiry, each of which used rational thought as its basis. These fields have remained to this day important components of Western culture, and are points of reference even for those who have rejected the Aristotelian framework. This book is an example of the latter. The problem with the Eleatic world view, and with everything that followed from it, lies in its singular understanding of the way human beings define the words they use. I have discussed the basis for language in detail, and noted repeatedly that for every person, each word has its own unique meaning that stems from the totality of personal experiences that the word is taken to symbolize. Thus, there is, for each person, a direct connection between the set of experiences and the word, a connection that links the former to the latter, and suggests the former when the word is put into use. I am right now, writing these words), then the self-same experience gets placed in the pool of experiences that have led to the definitions of “resolution” and of “gray”. In the latter case, this means that the print can, indeed, be “black” and “not black [but ‘gray’]” at the same time. That is what the Eleatics missed. One can hardly blame them for missing something when they were flush with the exhilaration of inventing a whole new way of thinking. The same applies to their successor Greek philosophers. On the contrary, one stands in awe of their creativity, as (to the best of our knowledge) no one before had attempted to separate “right thinking” from inappropriate thinking (its opposite…“not right thinking”). But we have come a long way in time and in thought, and we are now able to enrich our concept of thinking, and to reject any attempt to define one particular mode of thinking as more correct or appropriate than another. The linking of a particular experience to many words, and the linking of many experiences, which grow in number and become more varied with time, to a particular word, are two activities in which every person engages. This process has been given the label “organic thinking”, a label used primarily to remind a reader who encounters it that “rational thinking” cannot and should not be considered the only appropriate way of thinking about the world. 8. The Eleatics were so entrapped by their way of thinking that, when they tried to understand the natural world, they stumbled over every description they could come up with; none seemed to apply consistently, so none seemed applicable because of the law of contradiction. They ended up throwing up their hands, figuratively, and saying that the real world basically consists of one immutable object--"the One"--and that everything that we experience is a world of illusion. They then went on to write a great deal about natural philosophy, entitling their work "The World of Illusion". 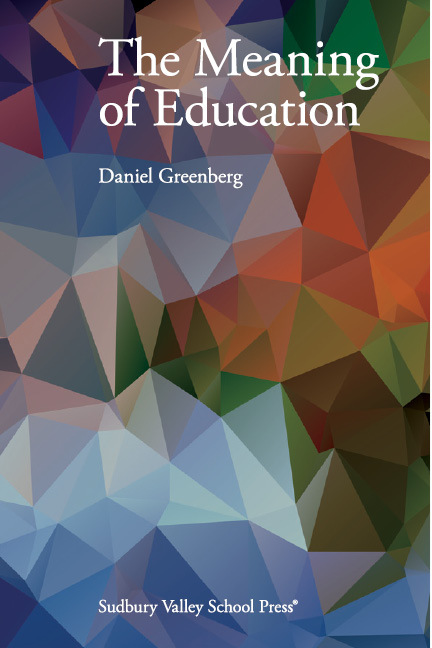 The task this book undertakes is to articulate the many strands that, together, form the fabric of education. While at first sight they may appear to be unrelated to the topic, they will reveal themselves as interwoven in a way that is beautiful and compelling. In the end, they will point to some conclusions that are, to most people today, strange and uncomfortable. Hopefully, seeing with clarity how the results flow from underlying realities will make it easier for those confined by the currently prevailing view of education to gain a new perspective on this subject. Education is learning how to survive, and become a productive person, in the surrounding environment.